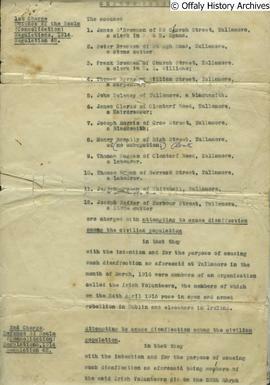 The Tullamore Incident refers to a breach of law and order on 20 March 1916 in Tullamore, Co. Offaly. It is frequently referred to as 'the first shots of the Rising' although it occured a month before the Easter Rebellion. A large crowd of locals whose family members were in the British army gathered outside the Gaelic League Rooms in Columcille St. protesting against the Irish Volunteers. 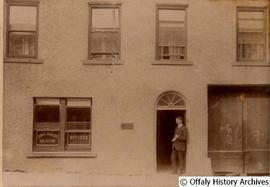 Shots were fired by Volunteers Peadar Bracken, Frank O'Brennan and Joe Wrafter. RIC Sergeant Ahern was injured by Bracken. 12 men were subsequently charged in relation to the incident. Notes entitled 'Information/Background Info' by Colm O'Brennan 2015'. Analysis of the Tullamore Incident with lists of those charged and court-martialled.